Istalling the inaugural exhibitions at NMAAHC. Lost Opportunities Exhibition Plan, 3D Rendering at the at the Russell Senate Office Building by Claudia Aguilar Huezo from Carlos Gomez on Vimeo. Read more about the exhibition and the NHSA. View the exhibition design brief as a PDF. Pakistan Through Our Eyes Exhibition Plan, 3D Rendering at the United States Institute of Peace by Claudia Aguilar Huezo from Carlos Gomez on Vimeo. View the exhibition brochure as a PDF. Download a PDF version of the 2012 Super Mama Djombo Tour Poster. Cobiana Communications & Culture received a Fulbright grant from the U.S. Department of State to produce a three-month artist residency program in 2012. The artist residency will help develop a new national “horn section” of willing saxophonists and trumpeters, conduct workshops in jazz and harmonica and stage performances that will highlight the results of this intensive instruction and collaboration. 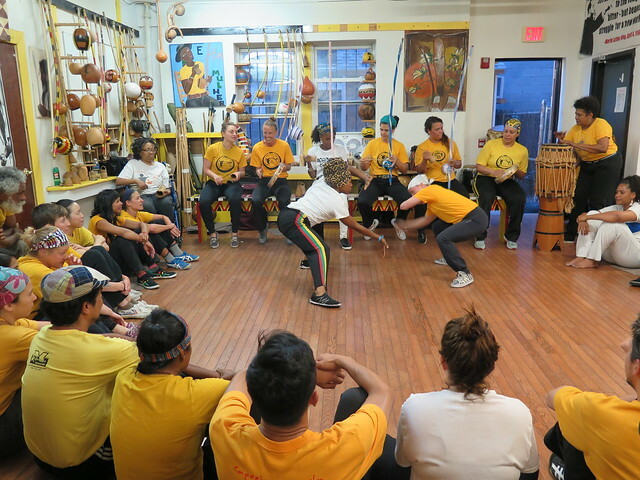 This effort will reinforce the national music of Guinea-Bissau, while building both technical skills and familiarity with the diversity of American cultural identities. Some 250 harmonicas will be gifted to children as part of the harmonica workshops. FCA-Studio provided a 1″x 3″ format label to fit on the Hohner Bluesband harmonicas. The color is PANTONE 185 M printed on silver foil. Special thanks to Hohner for the deep discount given on the harmonicas, and to the U.S. Department of State for making the residency a reality. 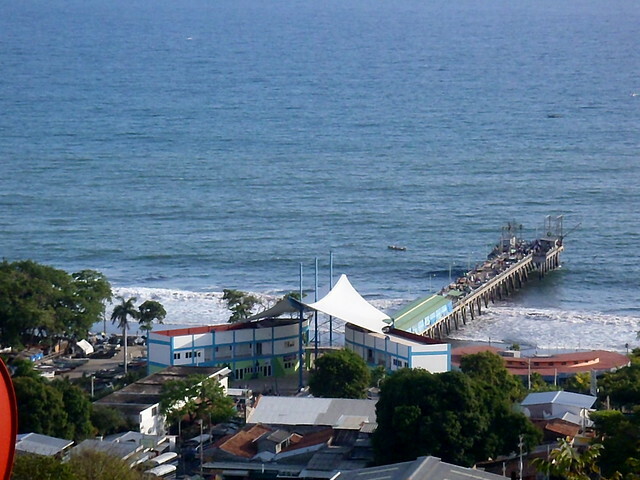 Phase 1: Collaborate with the Alcaldía of Puerto de La Libertad, El Salvador to build a futbol court with a viewing platform overlooking recreational areas and beaches of Pureto de La Libertad. Clean up the garbage dumps on the hillsides and perimeter of the landholding. Initiate an awareness campaign for the city’s recycling program. Phase 2: Construct a perimeter wall to protect the ecology of the hillside and ensure the safety of visitors. Initiate a tree planting campaign in Puerto de La Libertad. Phase 3: Construct a Water park within the perimeter that is an eco-friendly and attractive tourist destination. Begin a water treatment campaign in Puerto de La Libertad. Phase 4: Construct low impact habitation using bioconstruction methods to accommodate visitors. Muelle de pesca artesanal, Puerto de La Libertad, originally uploaded by FCA-Studio. Proyecto ROCAMAR met with town leaders to discuss the removal of garbage dumps. We view designs and take a tour of sites for a new recreation area. Homeless World Cup Legacy Center. The first collaborative effort of Proyecto ROCAMAR is with the Alcaldía of Puerto de La Libertad, El Salvador. December 19th, 2011, Proyecto ROCAMAR met with concejales of Puerto de La Libertad to discuss how to clean up the makeshift garbage dumps on hillsides above the city’s main waterflow (la quebrada). The group of concejales also viewed the landholding and possible sites to be given for public use and construction of a soccer court. In my search for examples of green recreational areas, I came across the Homeless World Cup Legacy Center, which I presented as a possible design. The project is compelling for it’s multipurpose approach in integrating recreation, tourism and green consciousness. We would like to achieve the same goals in the design for the hillside soccer court. The current leadership in Puerto de la Libertad is in favor of development for youth recreation and tourism. The two concerns go hand in hand. Supplying the community with places for youthful diversion helps redirect their energy away from risk factors and toward positive activity. Increasing the general safety and healthiness of residents increases the likelihood that tourists will visit and stay in the city longer. City leadership is invested in a rising tourism sector. The current optimism is due in part to El Salvador’s selection to receive a second Millennium Challenge Corporation grant. MCC provides well-performing countries with large-scale grants to fund country-led solutions for reducing poverty through sustainable economic growth. El Salvador has used the first grant to develop its North Zone by organizing an economic corridor that produces goods and services, food products and tourism services integrated with the rest of the country, a skilled workforce and high productivity. For the next Fomilenio, the Salvadoran government has earmarked the funds to develop the coastal area of the country, which has begun to generate high expectations in the tourism sector. Also of note is El Salvador’s outstanding performance in the 2011 Beach Soccer World Cup. The success of the team, made up of rural fishermen, has also sparked the hearts of Salvadorans and increased league participation throughout the country. A multipurpose and integrated design approach is ideal for the soccer court on the hillside above La Libertad. Sitting areas, changing rooms, spaces for cultural activities, viewing platforms, and playing fields will be inviting and friendly. The site’s architecture has the potential to accommodate and attract international visitors. The location will be central and accessible to the community that it serves. Using recycled materials in the construction and providing receptacles to separate waste materials will help establish recycling as another viable benefit to the local economy.